Sometimes in the world of lifelist fishing, anglers realize they have caught a new species of fish long after the fish has been captured when looking at some old photos; that species is called an armchair lifer—supposedly the angler is sitting at his armchair and not fishing, hence the name. This fish was caught way back in 2014, in Lake Crescent, Washington. I had identified it as a beardslee trout, Oncorhynchus mykiss irideus f. loc. beardsleei. This is a local form of coastal rainbow trout endemic to Lake Crescent. At the time, I thought that the above fish was a beardslee and thus my lifer rainbow trout. Upon further, more recent consideration, I have determined that this fish is actually a crescenti cutthroat trout, Oncorhynchus clarki clarki f. loc. crescenti, a local form of coastal cutthroat trout also endemic to Lake Crescent. - Fin pigmentation: coastal cutthroats, as well as crescenti cutthroats, have yellowish fins and often display brighter oranges at the fin tips. Beardslee rainbows have clear fins. 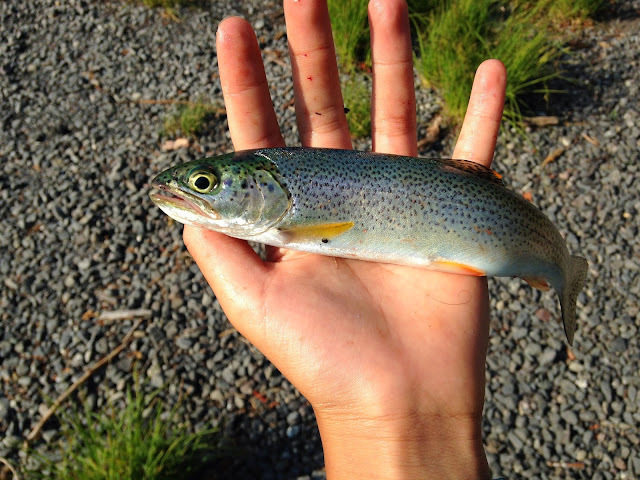 - Color: Crescenti cutthroat have a greenish tinge, while beardslee are generally a deeper blue. - Head proportions: the maxilla of the cutthroat is generally longer, as are the jaws. - Spotting below lateral line: In crescenti cutthroats, there are much more spots below the lateral line, and those spots are more well-defined. - Cutthroat marking: although coastal cutthroat trout sometimes lack the "cutthroat marking," and certain subspecies of rainbow trout sometimes possess it, you can see a tiny bit of pigment where the cut should be. This means that the cutthroat trout belongs on my lifelist, at the moment bringing my total up to 127 species of fish. It also means that I caught a cutthroat trout before a rainbow, which I think is pretty cool.